Monarch Air Group provides private air charter in Joliet, IL. Our clients benefit from top-notch service, unrelenting dedication to safety, wide selection of aircraft, and years of experience in chartering private jets. To obtain a free quote, please use our online quoting tool provided below, or call toll free 1-877-281-3051. Monarch Air Group provides private jet charter flights in and out of Joliet, Illinois, USA. Located 40 miles southwest of Chicago, Joliet is an industrial and commercial city in northeastern Illinois. With a population of about 147,433 people, Joliet is the 4th most populated in Illinois. The most popular tourist attractions include Rialto Square Theatre, Pilcher Park, Hammel Woods, Joliet Area Historical Museum, Silver Cross Field, Joliet Prison, Joliet Iron Works Historic Site, and much more. The nearest airports are Chicago Midway International Airport (MDW / KMDW), which is located 32 miles from the city, and Chicago O’Hare International Airport (ORD / KORD), which is located 50 miles from Joliet. 5. GYY, Gary/Chicago International, Gary (IN), United States. 6. IKK, Greater Kankakee, Kankakee, United States. 8. JOT, Municipal, Joliet, United States. 9. KKT, Kentland, Kentland, United States. 11. LPO, Municipal, Laporte, United States. 12. MDW, Midway, Chicago, United States. 13. MGC, Michigan City Arpt, Michigan City, United States. 14. NBU, NAS, Glenview, United States. 15. ORD, Chicago O'hare International, Chicago, Il, United States. 16. PWK, Pal-Waukee, Chicago, United States. 18. RNZ, Rensselaer, Rensselaer, United States. 20. VPZ, Porter County, Valparaiso, United States. 1. Harrah’s Joliet Hotel & Casino, 151 N Joliet St, Joliet. 2. Holiday Inn Joliet Banquet & Conference Center, 411 South Larkin Ave, Joliet. 3. 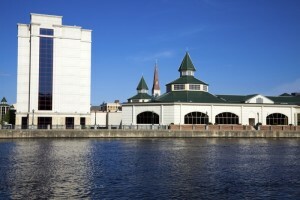 Harrah’s Joliet Hotel & Casino, 151 N Joliet St, Joliet. 4. Holiday Inn Joliet Banquet & Conference Center, 411 South Larkin Ave, Joliet. 5. Harrah’s Joliet Hotel & Casino, 151 N Joliet St, Joliet. 6. Holiday Inn Joliet Banquet & Conference Center, 411 South Larkin Ave, Joliet.